Since we started baking birthday cakes for kids in Hackney who wouldn’t otherwise receive them, we’ve made quite a few friends. And not just people who like cake (although show us a person who doesn’t like cake and we’ll show you someone who has clearly not let chocolate Guinness cake with cream cheese icing into their life). Where were we…? Oh yes, friends. 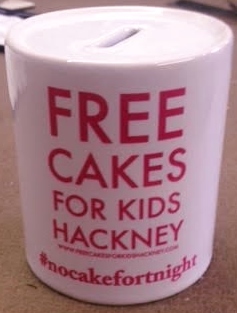 We are constantly blown away by the support we are offered from other people, businesses, groups and organisations both in Hackney and beyond. One such organisation that we now count as a friend is Localgiving.com. Saying we’re friends with Localgiving is a bit like proclaiming undying love for an ever so generous bank manager. But it’s more than just a business transaction. If you aren’t familiar with the organisation, Localgiving offers groups like ours an online fundraising platform, plus a load of personal support to go with it if you so wish. The cost to us is small and having an accessible, easy to use page on the web where anybody and everybody can donate to us whenever and wherever they wish is invaluable. – Without it we would have to be doling out our bank account details to any potential donor. – Without it we would have struggled to find a resource to fundraise for our Hackney half marathon and we certainly wouldn’t have had the lovely Lou give up cake for a month to raise money for us. – And without it we wouldn’t have gained £290-worth of *free* money through match funding. We love ’em so much we even bake them cakes … ! On the left is our lovely Laura (FCFK Hackney events supremo and super sew-er) presenting the lovely Localgiving Lou (of #nocakeAugust fame) with a bloody big cakey reward for going 31 days without even a crumb! So, as you can imagine, we were super excited when we heard that there was going to be new round of match funding called Grow Your Tenner and we jumped at the chance to go along to the launch party. Put simply, Grow Your Tenner is awesome. Lovely people donate a tenner to us through our Localgiving site and that tenner miraculously turns into TWENTY WHOLE GREAT BRITISH POUNDS, thanks to a pot of money kindly set aside by the Government’s Cabinet Office. It’s amazing. We can do a lot with £10, but we can do double that “a lot” with twenty quid, like pay for our insurance, our DBS checks … print leaflets advertising our service to new referrers, oh, and keep baking, of course … the sky is the limit. Small organinsations make money go a looooooooong way. Believe us. We also like Grow Your Tenner because it has this lovely flashy banner (which you might like to click on and have a go at turning a tenner of yours into £20 with no Paul Daniels or Debbie McGee in sight). Oooh, flashy banner. Click, click, click! What we weren’t expecting when we rocked up to the Grow Your Tenner launch party was for Rob Wilson MP, Minister for Civil Society – who was there to officially welcome the new round of match funding – to pledge to raise money for us too. Yes, really! He said he loved cake! … and whilst he couldn’t go a whole month without it, he would happily give it up for a fortnight and donate the money he would ordinarily spend on cake in that fortnight to us instead. Cue some rather large smiles from us. We’ve sent him this rather snazzy little moneybox to help him on his way and will keep you posted with his progress in the endeavour that we have snappily named #nocakefortnight. In the meantime, thank you if you’ve already donated to us through our Localgiving site. You rock. And we mean it when we say we couldn’t do without those tenners that you so generously donate (especially the magic ones that turn into twenties). Money doesn’t make the world go round; cake does. But money helps to make the cake that makes the world go round. « Do us a favour. Yes, another one. Pleeease!